Now You See It, Now You Don’t (1982-1989) and House of Cards (1989-1996) is Marion Merrick’s dual volume personal account of life in Budapest, both pre and post the collapse of Soviet power. Now You See It, Now You Don’t (1982-1989) concentrates on a world encountered on the streets of Budapest which disappeared following the changes in state after the fall of the Berlin wall. The book chronicles Merrick’s first - and Communism’s last - seven years in Hungary, years full with absurdities and illogicalities, yet also brimming with the characters and unique atmosphere which led her to stay. 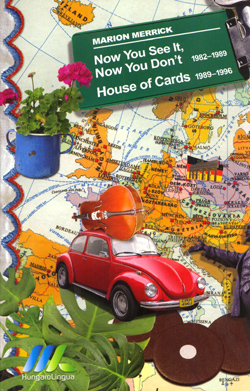 House of Cards (1989-1996) provides a sequel to Now You See It, Now You Don’t, following the fate of the country and its people in the first seven years of post-Communist Hungary. The book tracks the initial joy and disbelief at the 1989 implosion of the regime, to the realities and implications of such a dramatic change that affected everyone.